Almost no one had heard of social media a decade ago, but today websites such as Facebook, Twitter, and LinkedIn have more than 1 billion users and account for almost 25 percent of Internet use. Practically overnight, social media seems indispensable to our lives--from friendship and dating to news and business.What makes social media so different from traditional media? Answering that question is the key to making social media work for any business, argues Miko?aj Piskorski, one of the world’s leading experts on the business of social media. In A Social Strategy, he provides the most convincing answer yet, one backed by original research, data, and case studies from companies such as Nike and American Express.Drawing on his analysis of proprietary data from social media sites, Piskorski argues that the secret of successful ones is that they allow people to fulfill social needs that either can’t be met offline or can be met only at much greater cost. This insight provides the key to how companies can leverage social platforms to create a sustainable competitive advantage. Companies need to help people interact with each other before they will promote products to their friends or help companies in other ways. Done right, a company’s social media should benefit customers and the firm. 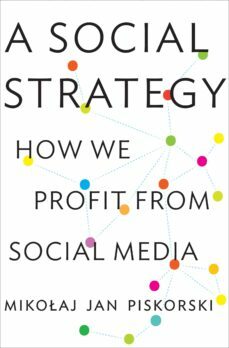 Piskorski calls this "a social strategy," and he describes how companies such as Yelp and Zynga have done it.Groundbreaking and important, A Social Strategy provides not only a story- and data-driven explanation for the explosion of social media but also an invaluable, concrete road map for any company that wants to tap the marketing potential of this remarkable phenomenon.